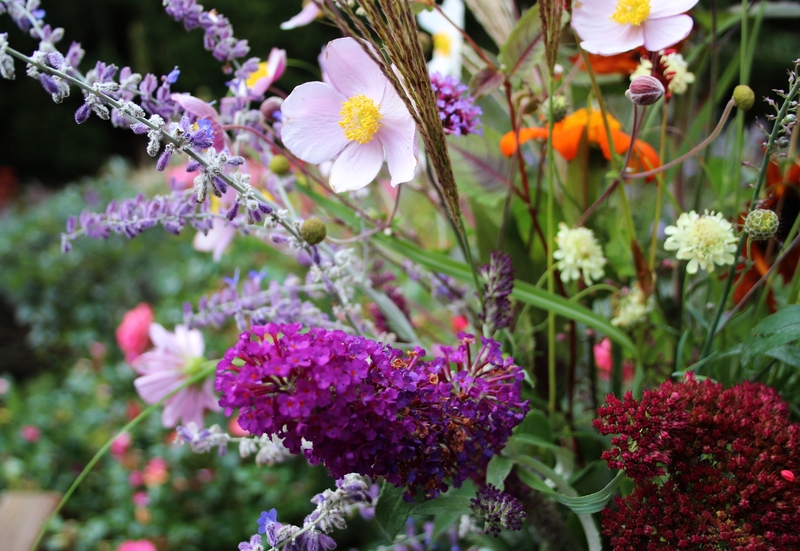 In a Vase on Monday: October, October! 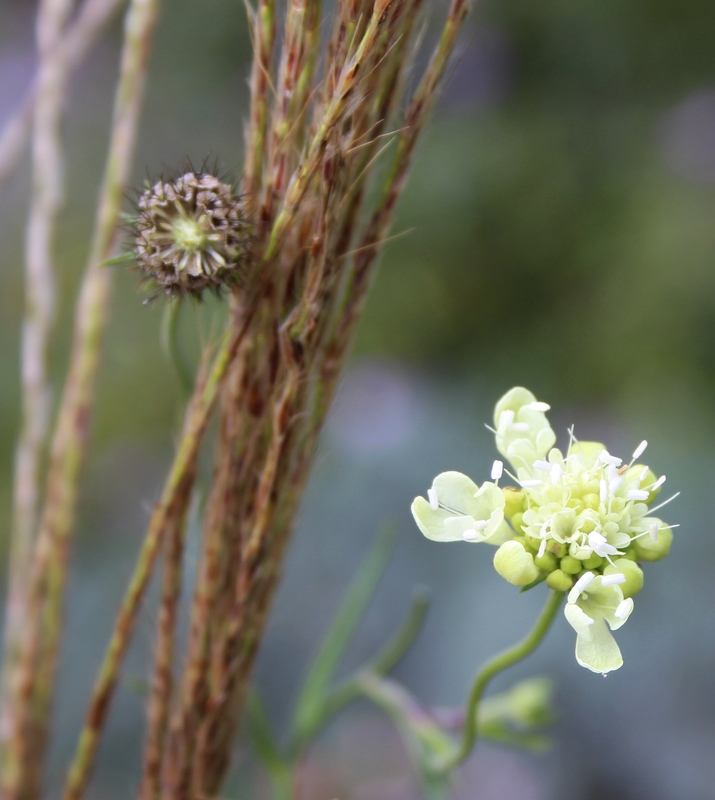 And the Scabiosa ochroleuca below is also still producing a few flowers. I hope it sets lots of seeds! 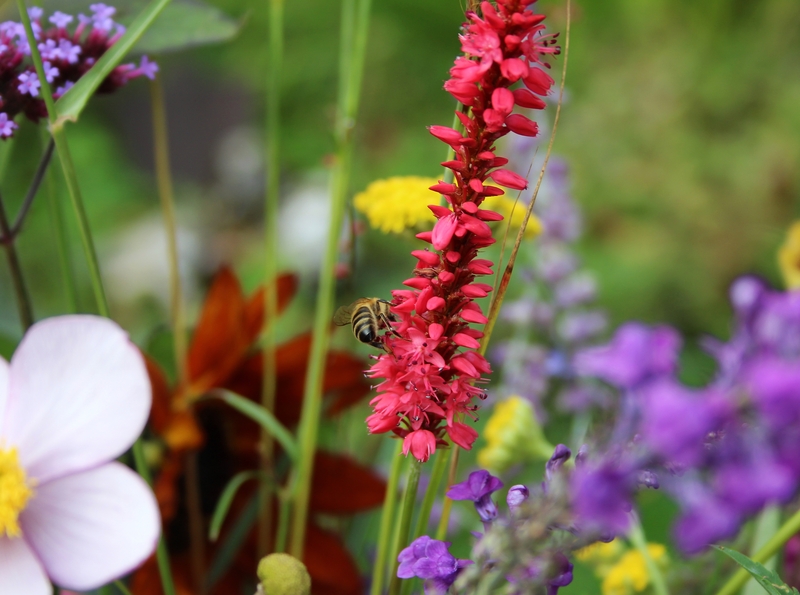 I am joining Cathy at Rambling in the Garden for her weekly meme and hope you will also take a look at her vase today, as well as all the others linking in from around the globe. Oh, and this last little vase was also put together with some leftover bits and pieces. That is a lovely Cactus Zinnia at the centre, with some Asters, Roses, Leadwort and Cosmos, and some Hypericum berries picking up the pinky orange colours nicely. Have a great week everyone, and a special hello and thank you to my sister for the vase! This entry was posted in Garden, In a Vase on Monday and tagged Autumn, Cut Flowers, Garden, Seasons. Bookmark the permalink. Happy Birthday and such a lovely jug – the perfect present for you. 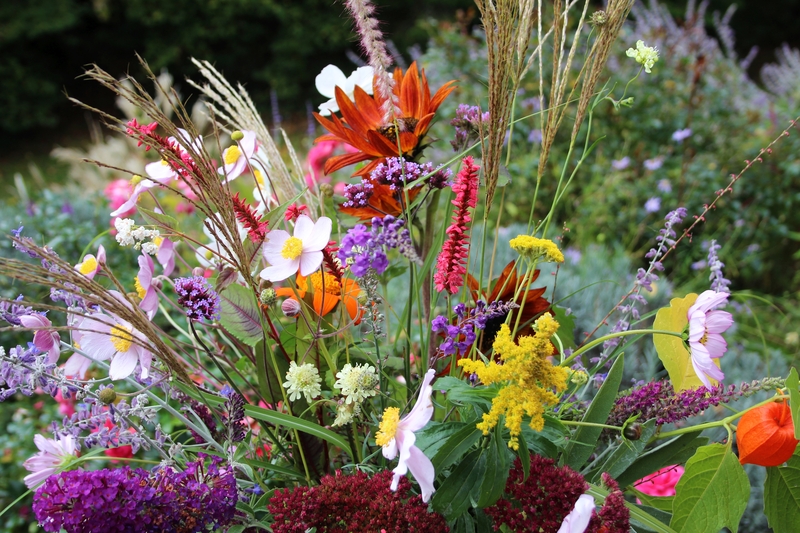 Once again a lovely arrangement of garden flowers. 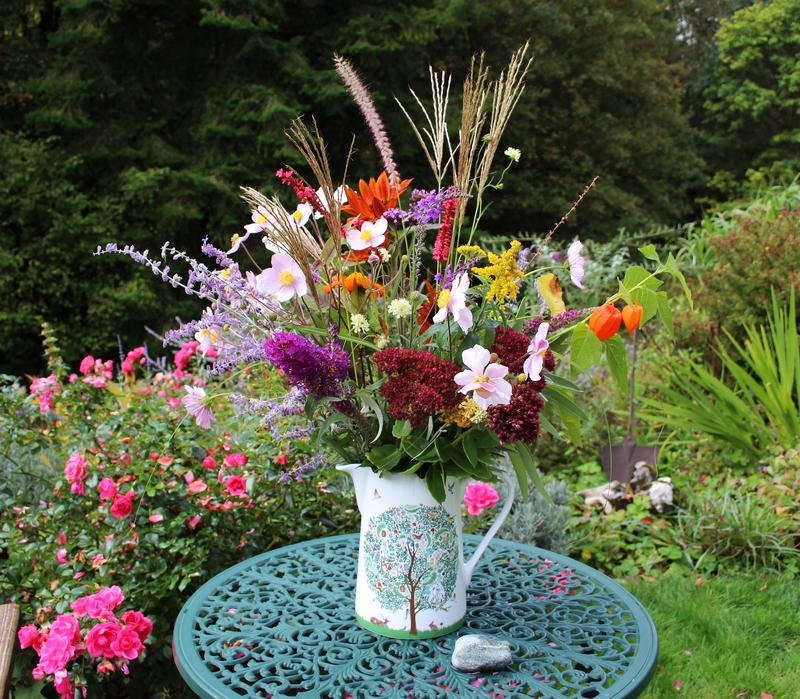 I love the many flowers in the jug, they are very eye catching. Happy Birthday! Thanks! 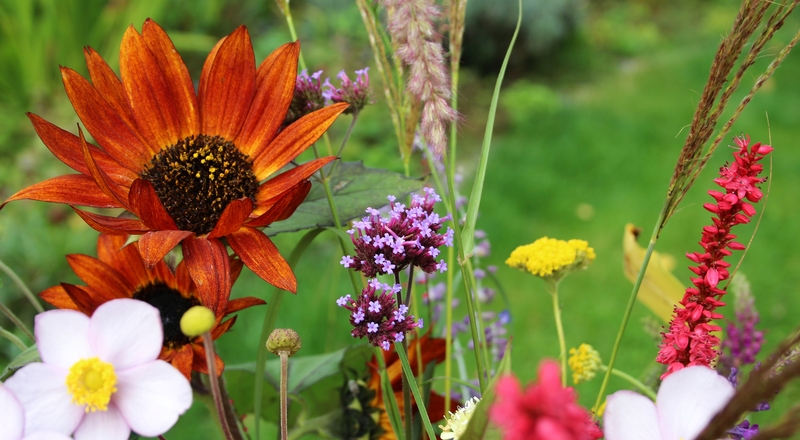 I am amazed at how much colour I still have in the garden! Happy Birthday Cathy! A splendid arrangement for a beautiful vase! Happy birthday, Cathy. What a lovely vase and gorgeous flowers you found to fill it. Thank you Sam! It was a lovely weekend, despite rather dreary weather! It puts things into perspective when you start counting like that! Happy Birthday- and what a glorious vase! So beautiful. Thanks for sharing your photos. All the best. The flowers and the vase are enchanted. Lovely. I agree, ‘enchanted’ is the perfect word. Thanks! Hi Cathy, wellcome in the 50ies and Happy Birthday to you! The vase is beautiful from the form and decor and from the filling. May the upcoming years be similar! Thank you very much Uta! I am sure this vase will be used very frequently! What a nice gift – Happy Birthday. The vase is lovely. So lovely and the vase is beautiful. Happy Birthday! Wow you still have such a large variety of blooms. Very lovely arrangement. Your sister found the perfect gift for your birthday. Happy Birthday Cathy! Happy birthday, Cathy! 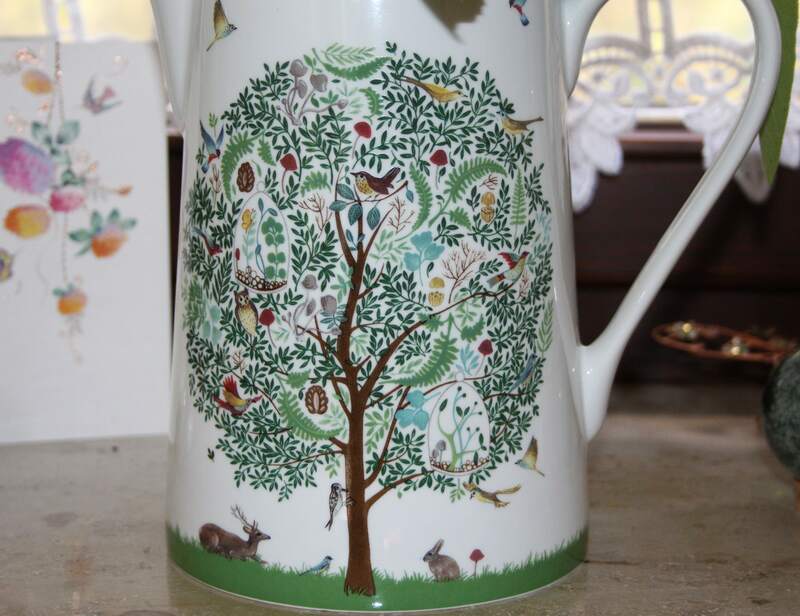 Love the vase…with all the critters it is truly a tree of life and perfect for your special day. Happy happy birthday! Your sister has excellent taste in vases and I think your mixed assemblage fits it well. Thanks Kris. Precisely – my sister has very good taste and this vase is absolutely perfect for me! Happy Birthday and I actually just want the Portmerion jug! It is lovely, isn’t it! Thank you Amelia! Wishing you a belated Happy Birthday Cathy! I hope that your special day was filled with both flowers and fun. You must have been delighted with your gift from your sister. You’ve filled it beautifully. Happy Birthday! My 50 was a very happy time for me. Now I’m 55 and still hoping I’ll learn the names of all these flowers in my garden! Thank you Helen. I have trained myself to remember the names of plants so I can talk to my Mum (also a keen gardener) about them, the botanical name being the link between English and German. But at the end of the day it doesn’t really matter what they are called! 😉 Thanks for visiting! What a special vase…and a happy, happy birthday. Many, many more. What a special vase, I love the jug and all the flowers you put in it !Happy birthday, Cathy! What a splendid sister. What a splendid vase! A very happy birthday and I hope those airy and beautiful flowers gave you great pleasure all day. What a darling pitcher – you’ve filled it well with the essence of autumn. Happy Half-Century – 😉 I think the Fabulous Fifties is the best decade! Enjoy! Happy birthday, Cathy. Your sister chose the perfect gift for you, what a charming pattern. Thanks Kate. It is quite lovely and I shall enjoy using it for future Monday vases too! Happy Birthday Cathy, I hope you had a lovely day. Your sisters’ present of a new vase couldn’t be betterl and you’ve filled it with a multitude of colourful blooms. Thanks Amy. Still so much to choose from for my vases, so I am making the most of them while I can! Many happy returns birthday gal. As always your mixture of flowers is a delight which shows off your lovely new vase. 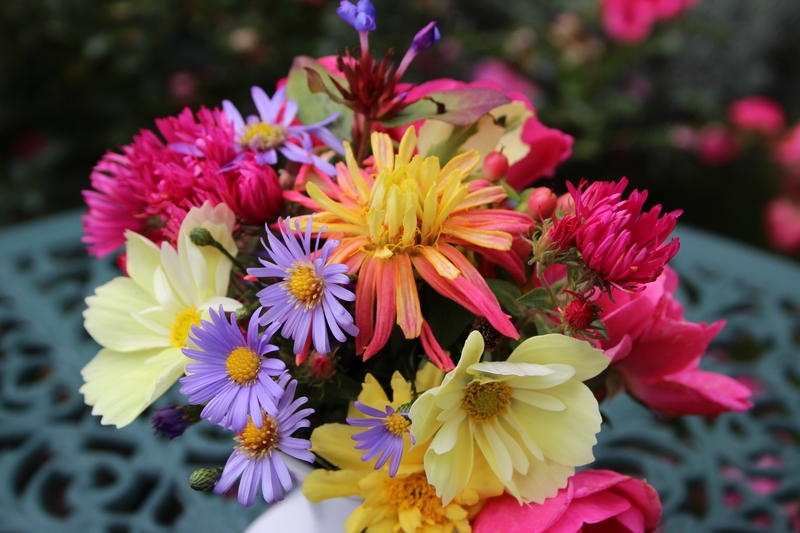 Wonderful autumn collection of flowers in a beautiful birthday gift. Your arrangement is worthy of helping you celebrate…Happy Birthday! I hope you enjoyed your birthday away.